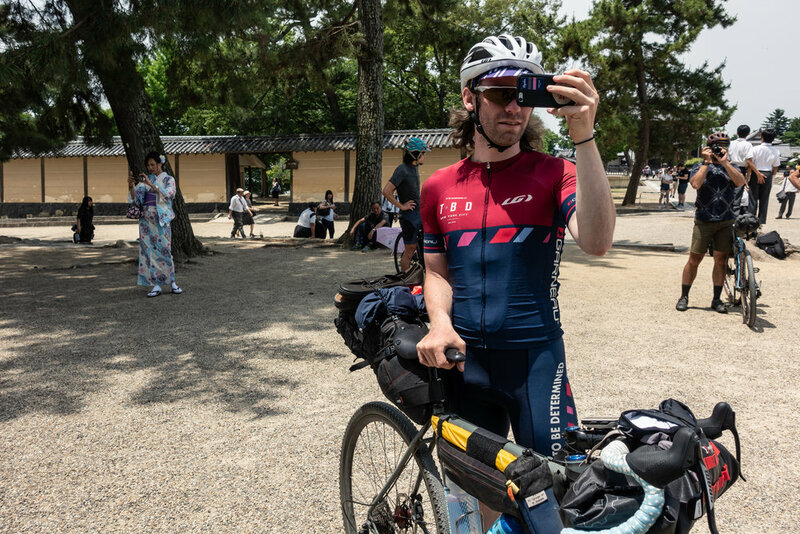 In the final part of his three part series on bikepacking Japan, Chris Burati tackles Tsurugi Super Forest Road, more onsens, the beauty of the Shiminami Kaido, the modern art of Naoshima, and the haunting landscape of Hiroshima. “Chris, we gotta go” Joe said through my tent. It was 4 am and the sun was just rising over the Pacific. A security officer had come down and asked us to leave shortly before. Parker tried to plead our case, but we technically shouldn’t have been there. “I suppose some people do care about wild camping in Japan” I thought. 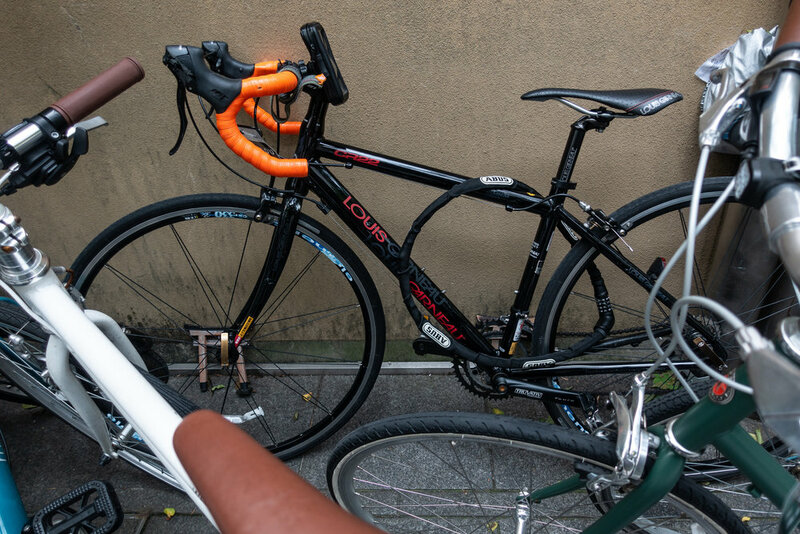 Another day, another singular job of pedaling our bikes from point A to point B. We were approaching a leg of the journey we had been joking would be our grave since before we set off. Tsurugi Super Forest Road is legendary. 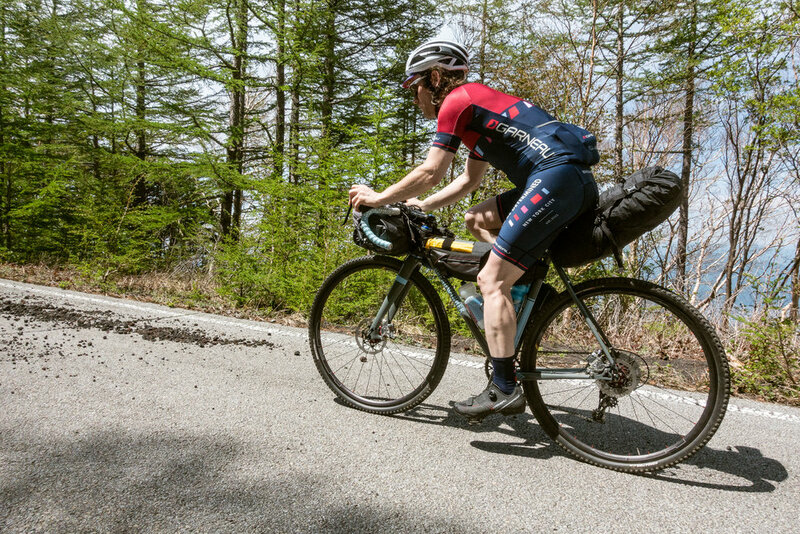 The route called for 70 miles, 12 thousand feet up, and 15 thousand feet down, all on the gnarliest of gravel. This day was unique, we would be making a supply run that would need to last us three days as we had no known re-supply spots from Tokushima to Tsurugi and then after. Luckily there was our mecca nearby, Lawsons or Family Mart or 7-Eleven. It didn’t matter. We lived off of convenient store food for most of the trip. 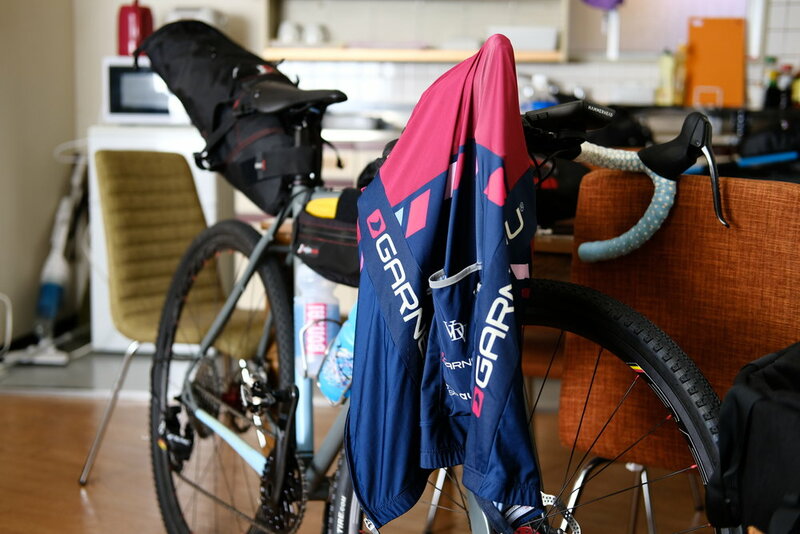 Every available nook and cranny in my bags had food crammed in, all of my jersey pockets were full, and I still felt like I wouldn’t have enough food to survive 24 hours of on the bike pedaling before our next conceivable store. Thankfully I was only sort of wrong. 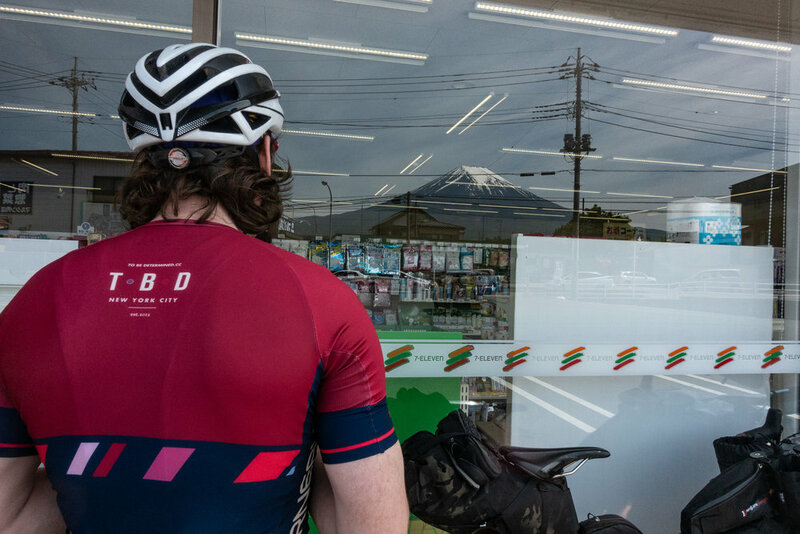 We made our way to the Super Forest Road “base camp” and found a small store. I bought more food. Up we went. The climb was unreal. I said I’d never forget four climbs on the trip, and this was number three on that list. We climbed above the clouds into freezing temperatures, strong wind, rain, and fog so thick you couldn’t see more than a foot in front of you. Needless to say, descending was utterly terrifying. This trend continued - up above the clouds, down below them, and up again. Eventually the pavement ended and the forest road began. It was more jagged rocks than gravel. Every inch that passed I prayed the small gray knives wouldn’t slice my tire. Parker flatted, then Bryan flatted, then Parker flatted, and then I flatted. Within a span of two miles our remaining tube supply had been exhausted. Priority one was making it to the onsen. Once there we could figure out what to do about our tube situation and the rest of Tsurugi whose jaws we were staring into. We limped our way to Shikibidani Spa onsen praying for no more flats, and the bike gods answered our prayers. Beer, whisky, baths, and a dinner where every dish was deer-based followed. 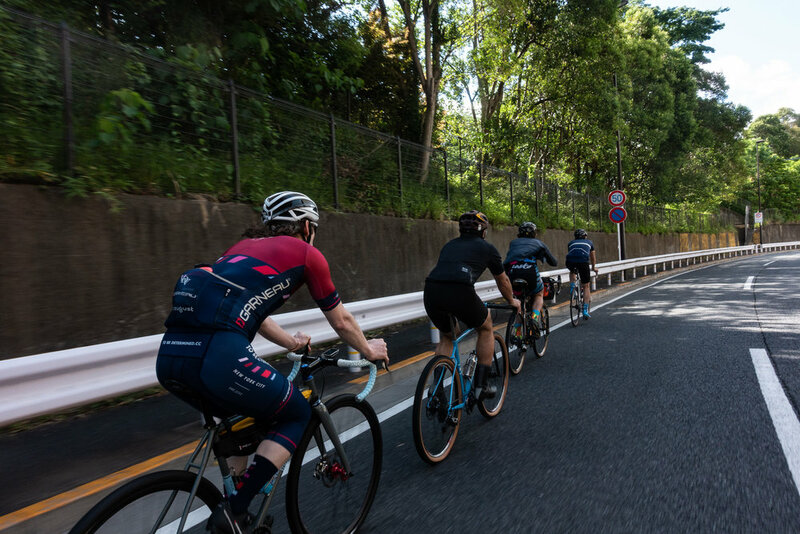 I won’t go into the details, but after much spirited debate, Google Translate, and a bike mechanic’s late night car ride from Tokushima to the onsen, we had tubes. The floor was shaking. The building was shaking. No lawn mower birds, but a small earthquake awakened us. Rain fell heavily outside of our room’s window. We had tubes, but how the heck were we supposed to do the Super Mountain Forest Road in this weather? Would it even be passable? More spirited debate. As much as we wanted to make our graves the Super Mountain Forest Road, it wasn’t to be. Parker borrowed the hotel’s computer and re-routed us around the road and towards our next destination. Make no mistake, the re-route was not easy. It was short, only 32 miles, but you had to go straight up. We were heading towards the base of Tsurugisan, another revered mountain. Skip the forest road and climb straight to the mountain in the pouring rain. So we did, and it boy was it climb-ey. More gnarly fog and ascending and descending. It was getting dark and we were at the top of the Tsurugisan base. It took us 7,000 feet of climbing just to get to the base, and luckily we were going straight down rather than continuing up. Towards the top we stopped in an unused car tunnel to hide from the rain and joked about a restaurant and bar being just around the corner. Let it be known that Japan does not disappoint. There was a flipping restaurant exactly around the corner. It was open, it had beer, it had noodles, it had a wood stove fire going, it was perfect. Before drinking too much, Bryan and I reconned the area. It was clearly a tourist and hiker destination, but seemed to be the off season given the rainy months were partially upon us. There were small houses and huts everywhere, each one shuttered. We climbed our way up 100 steps to large twin Buddhist and Shinto shrines built to honor Tsurugisan. 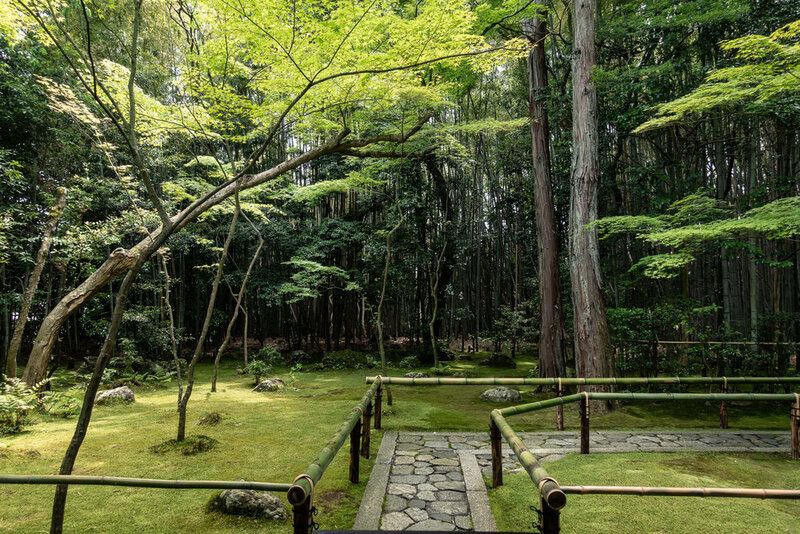 To the right of the Shinto shrine lay a guest house most likely for hikers. Bryan and I looked at each other and needn't have said a word. We were sleeping there. Once we knew we didn’t need to do the death descent that awaited us in the dark, we got imbibed. 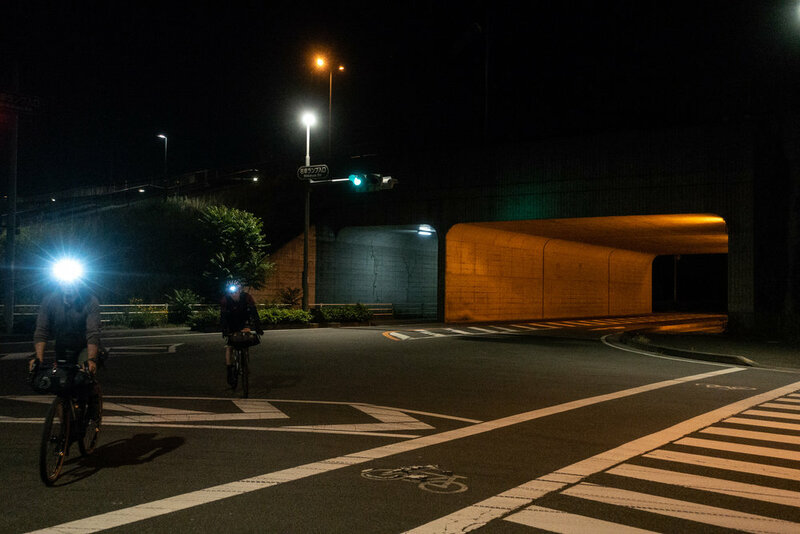 Once it was fully dark, we quietly headed up the steps, lugging our bikes up all 100. At the top there was now a house with a light on. Out of respect we inquired about the guest house. The response was $50 per person for the night. After some wrangling, the man who owned the house let us sleep in the shrine’s adjoining tatami room. He, after all, was the head priest and caretaker so he took pity on the pathetic picture we painted for him. We awoke to a gong and the sound of chanting and prayer. That was our cue to leave. 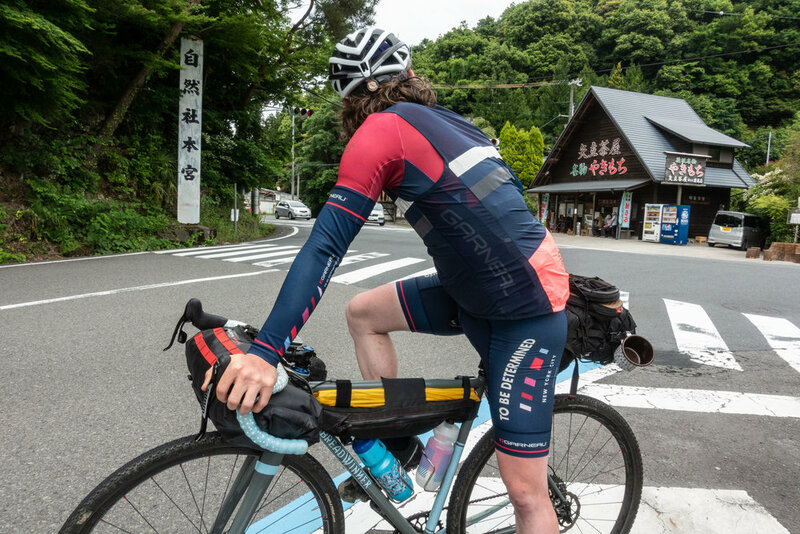 It was still raining as we made our way down from Tsurugisan, a long 25 mile descent towards the port city of Takamatsu. Best we did that one while sober and in daylight. About 10 miles down Bryan was accosted by wild dogs. The dogs sent him tumbling into the gutter and then into a retention wall. He was scraped and bruised, and his front rack was mangled, but we managed to field dress both him and the rack, and were on our way again. We ate curry for lunch and waited out two periods of torrential rain, only moving on when it let up. We made good time and reached Takamatsu by late afternoon. The plan was take the ferry to Naoshima in the morning. 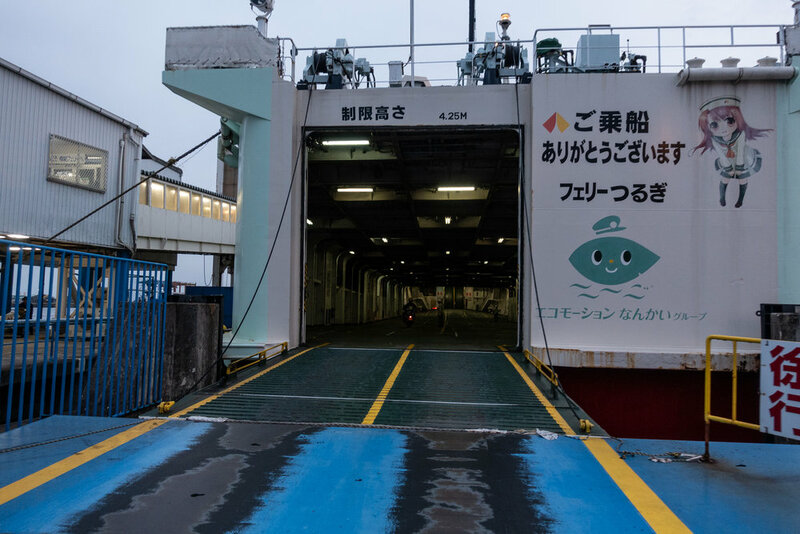 Armed with the prospect of camping on Naoshima, the world famous modern art island, we inquired about taking the last ferry over. Having missed it, we had no choice but to take photos of the gorgeous sunset over the Harima-nada Sea. Takamatsu is a port city home to almost half a million, and reminded me very much of San Francisco. We picked a good place to find dinner, and went the the sushi route as we - more like I - was growing tired of noodles and convenience store food. We ate and then discovered there was an actual campground in the city. 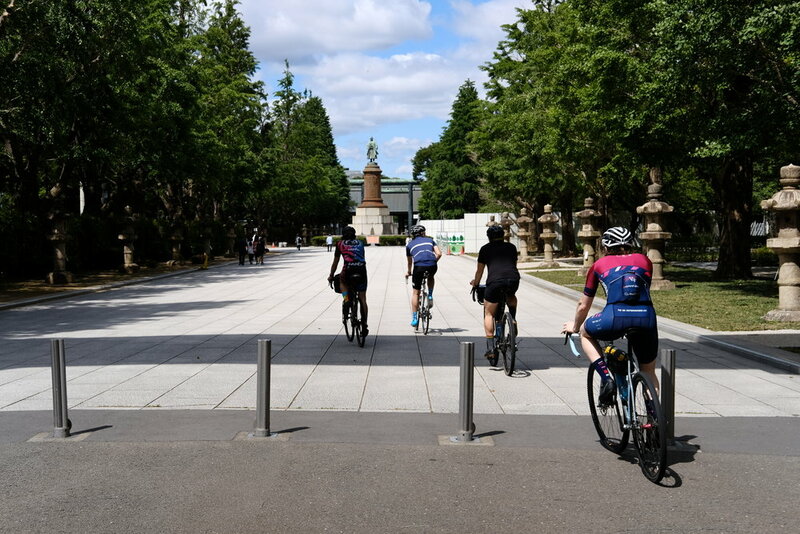 Conveniently omitted was the fact that the campground was miles away and at the top of a two and a half mile climb in the middle of Takamatsu Mineyama Park. I was not pleased. Exhausted from the climb I opted to skip a visit to the overlook, crowded with amorous teenagers, and went straight to bed. 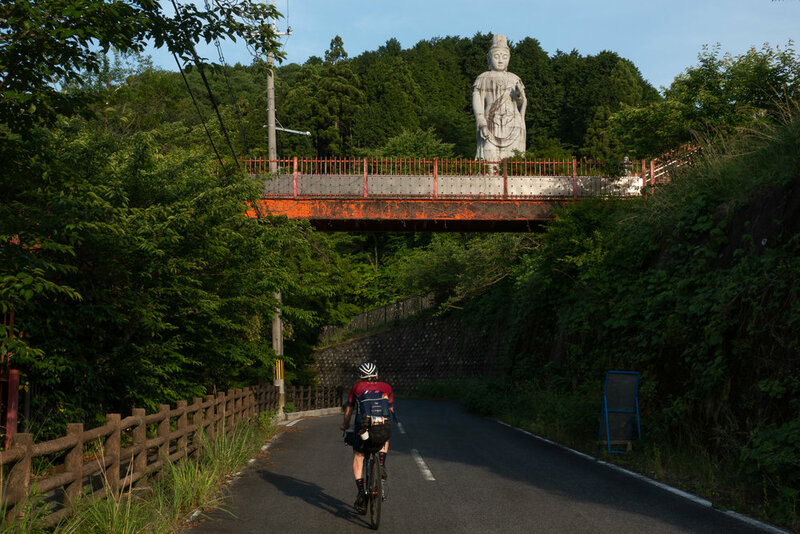 There were a few highlights as we made our way to Onomichi, but the riding was not one of them. It was flat, industrial, heavily trafficked, and one of the more utilitarian days. 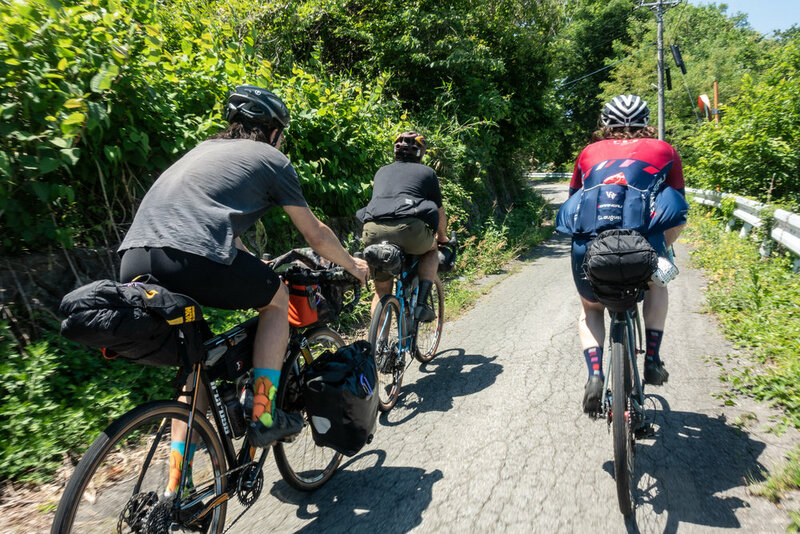 We hammered our way over 63 miles of slightly rolling terrain making it easily our fastest day on the bike. However, I do have much to say about the beginning and end points of our trip - Naoshima, an island full of modern art museums and outdoor installations, and Onomichi, a seemingly up and coming city that is going through what appears to be a revitalization with young people coming back after years in larger cities such as Tokyo and Osaka. We started the day with a beautiful 45 minute ferry ride to the small island of Naoshima located in the Seto Inland Sea. Formerly just a small fishing community, it’s now a bustling mecca of modern art. We spent the better part of the morning wandering the private and public beaches of the island, taking in the outdoor sculpture installations including the famous pumpkin statue by Yayoi Kusama. We visited the Lee Ufan museum known for it’s beautiful architecture designed by Tadao Ando (who designed many of the museums on the island). I definitely recommend making a side trip to Naoshima if visiting Japan. You can learn more about it here. Sadly, we could only make a brief visit to the island as we had a full day on the bike, and morning was melting into afternoon. We took a short ferry journey north and landed in Uno. 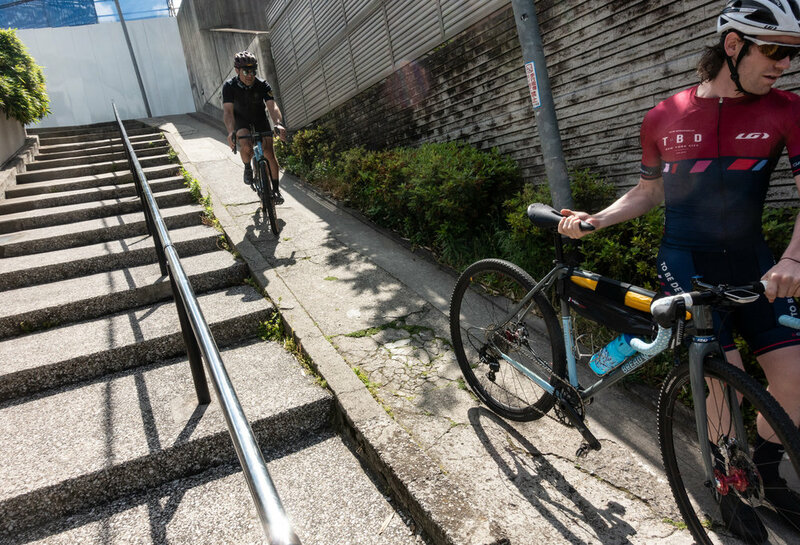 Our destination was Onomichi known for being the starting point as one of the most beautiful cycle routes in the world, the Shimanami Kaido, which we’d be tackling the next day. I fell in love with Onomichi. 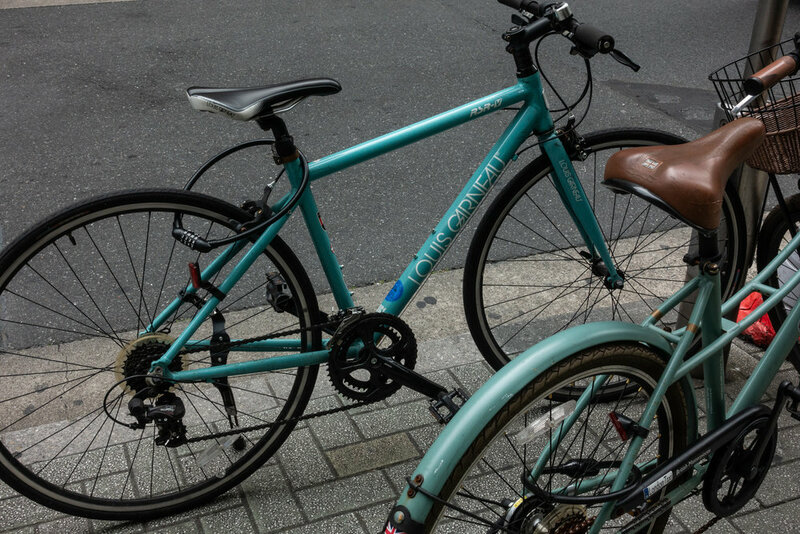 If Tokushima reminded me of San Francisco then Onomichi reminded me of Portland, Oregon. Dense city rose on either side of the narrow portion of the inland sea with temples dotting some of the highest peaks. Our lodging for the night was a non-profit restored and run guest house called Miharashi-Tei Guest House. 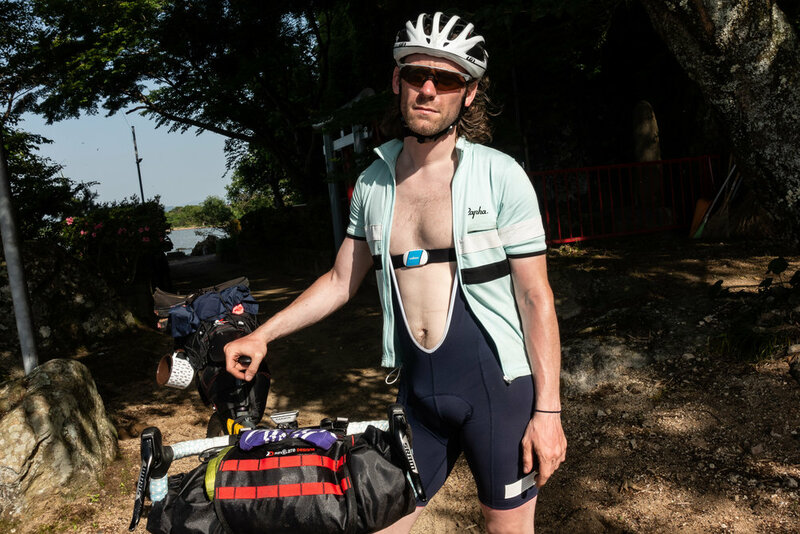 Joe found this gem of a place after trying to book a room at the cycling themed hotel, onomichi u2, which was full. In hindsight I’d much prefer our inn if given the choice. Miharashi-Tei sits atop 360 steps and next to Senkoji Park home to several Buddhist and Shinto shrines. The cafe of the guest house, which has all of the beer, artisanal coffee, and pastries one could ask for, overlooks the entirety of Onomichi. The view is absolutely stunning. In order to enjoy this view, we had to carry 50 pound bikes up 360 stairs. Ten minutes and 15 breaks later, we were at the top. Our first order of business was introducing our poor roommates to our smelly kit (the four of us stayed in a nine person guest room). The second was showering and finding food. Through happenstance we ended up at the only restaurant in the area that was still open. We sat on a stoop across the street from Ramen Matatabi waiting for the revelers to depart so we could get a seat in the small nine person shop. A little girl was running around, beaming smile on her face, playing with what could have been the reincarnation of John Lennon. A drunk man lay on the steps of a house adjacent to the little shop, moaning and vomiting off the side. The little girl took great joy in pulling at his clothes and hair, much to everyone else’s amusement. Merriment poured from all corners of the street. As we sat taking it all in, a woman came out and asked in English if we wanted to eat and drink. Of course we did, and next thing we knew we had giant bottles of beer and endless Japanese snacks coming to us. We slowly were inducted into this party crowd. They were a group of friends enjoying the evening in each other’s company. Some had worked together - at a vegan chocolatier and print screening company, respectively - some had grown up here and had moved away and were back visiting and all were friends with the couple who owned the shop. The women was married to the chef and the little girl was their daughter. 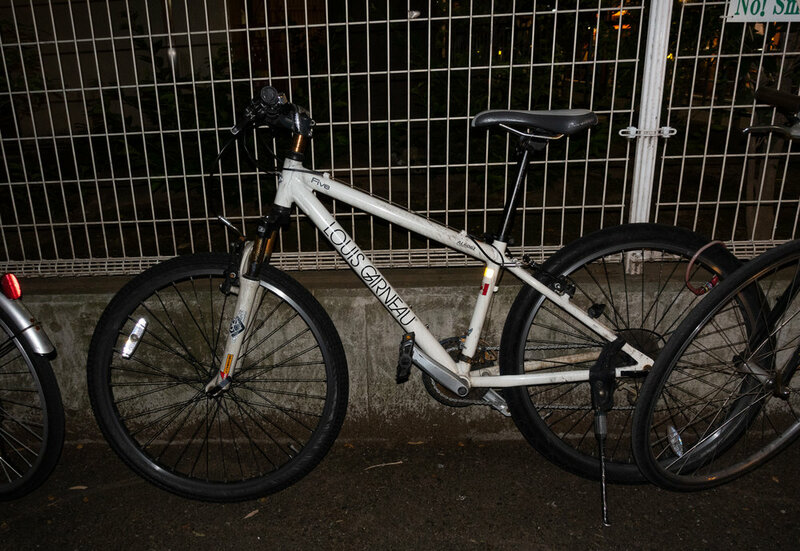 The drunk man passed out across the street was their good friend and allegedly the most famous rapper in Onomichi. This last fact went unconfirmed. Once inside, the owners cooked up vegetarian ramen and endlessly poured us Shōchū, beer, and anything else they had on the shelf. They even created a new mixed drink for us. Another bittersweet parting was upon us as we realized it was getting late, we were quite tipsy, and we had an early wake up and long day on the other side of night. They gifted us a large bottle of beer to make the trip up the 360 steps less painful. It did. We started the day with a buffet breakfast and coffee in the onomichi u2. 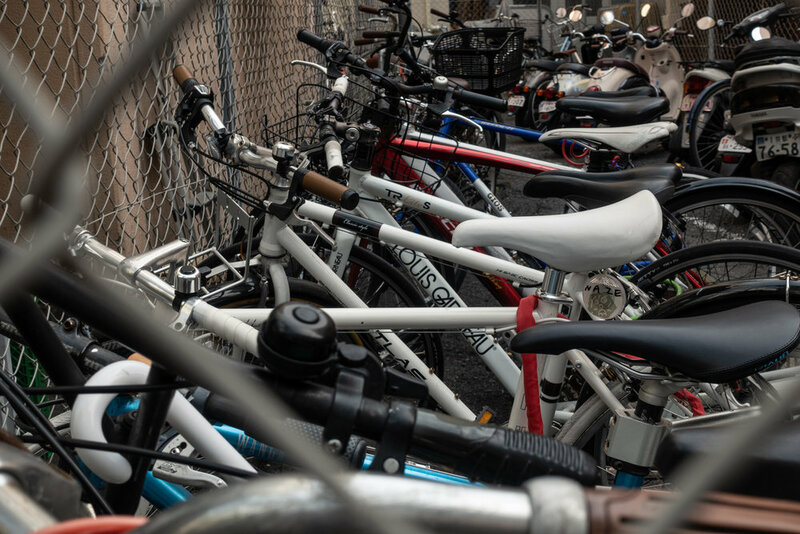 The dining area was filled with cyclists from all corners of the world. 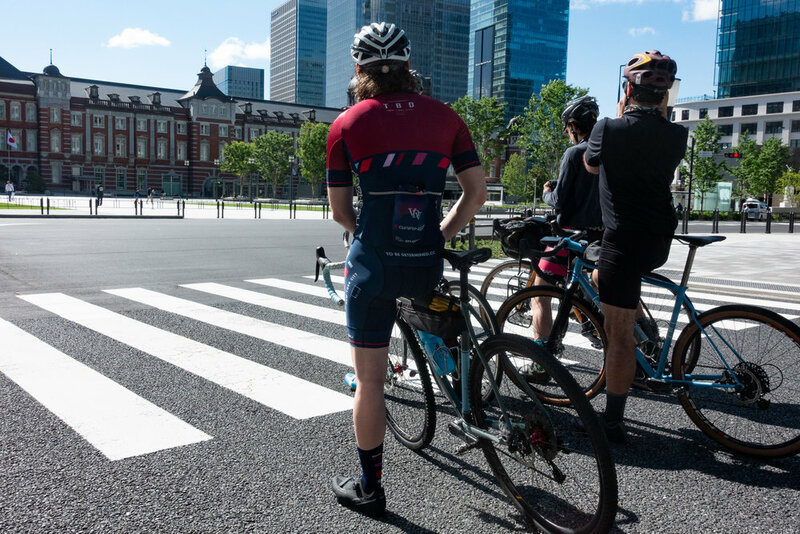 We sat at a table next to a group of Japanese cyclists each one with a caricature of themselves complete with nickname on the backs of their matching pink jerseys. I wanted to be a part of their club. 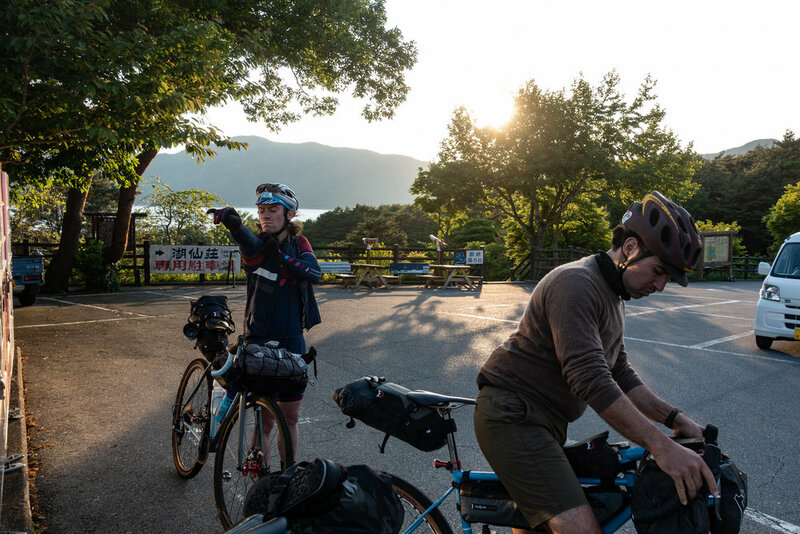 More wheel and brake issues for Parker including the discovery of a torn sidewall, but once they were patched and sorted we found ourselves on a quite short ferry ride to the Shimanami Kaido’s starting point just opposite the narrow channel of the inland sea. The Shimanami Kaido is absolutely stunning. 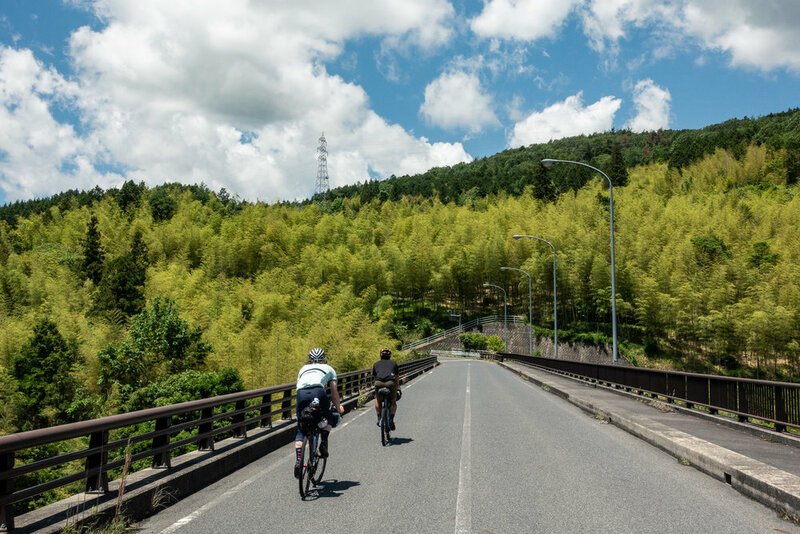 The route is marked in blue along the side of the road, taking you over short and long architecturally gorgeous bridges, criss crossing small islands as well as back and forth between the main islands of Honshu and Shikoku. Rest stops including snacks and gelato seemed to be at every mile marker, grinning cyclists packed in every one. 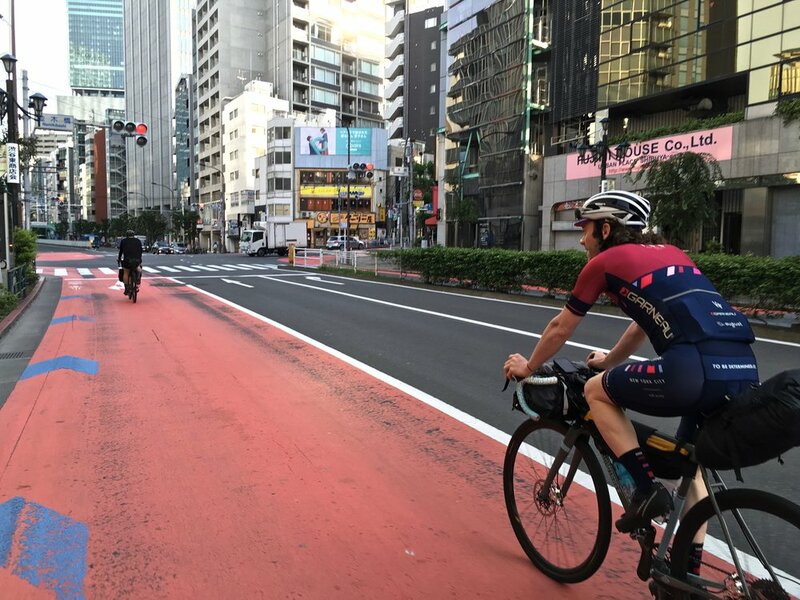 There were even coffee shops sprinkled along the path specifically open during peak riding hours. The route is relatively flat with the only real climbing being the gently sloping lead ups to the bridges. The sky was bright blue with a cool breeze providing a nice balance to the beating sun. 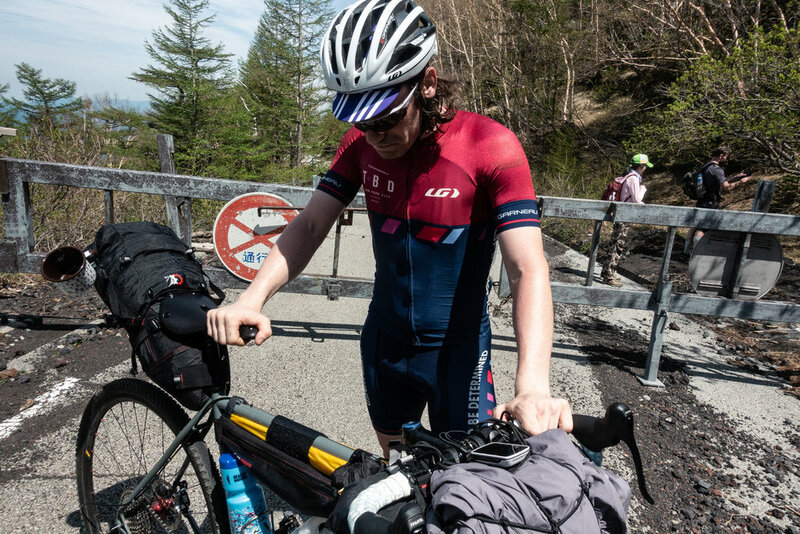 Eventually we had to turn off the route, and found ourselves back on narrow country roads, climbing up into the final mountain range we needed to pass over before Hiroshima. Dinner was purchased at, you guessed it, 7-Eleven. With ramen strapped to my bike and potato chip canisters in my pockets, we were ready to find our last campsite. 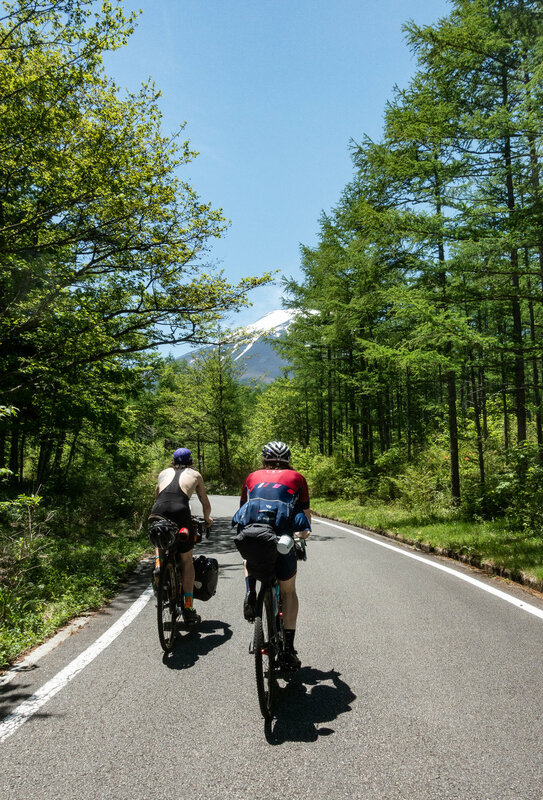 We pulled the riding pin right before our final climbs of the trip as we spotted a flat canopied spot on the gravel forest road we were riding. It was 6 pm and we had an hour of daylight to get camp set up, a fire built, and dinner in our bellies before turning in. We passed around convenient store Suntory whiskey while talking about all we had seen over the last 13 days. Just a “small” climb awaited us the next day before a long descent to an onsen and then on to Hiroshima. We were up early and on our way. I had a somewhat restless sleep as it was hot, humid, buggy, and I kept having a waking dream that my tent was tumbling off the stream bank I was pitched on. We prepared a quick breakfast and were back on the hiking trail. We needed to make up ground as we never tackled the remaining two climbs the day before. The hiking trail gave way to a short paved climb and then we were on the final “short” climb. We started climbing and I noticed a sign in Japanese saying something was 14 kilometers away. Surely that was not the summit. Up and up on the fourth most memorable climb we went. Everyone was riding at their own speed as climbing was finally starting to take a heavy toll. My back aching I rode past signs saying 10 kilometers then 5 kilometers. Maybe the signs were indeed for the top? They were. The ‘small” climb was actually a 14k, nearly 3,000 foot ascent on a breathtaking logging road. We were at the top and done. All that was left was to descend to the onsen and Hiroshima. 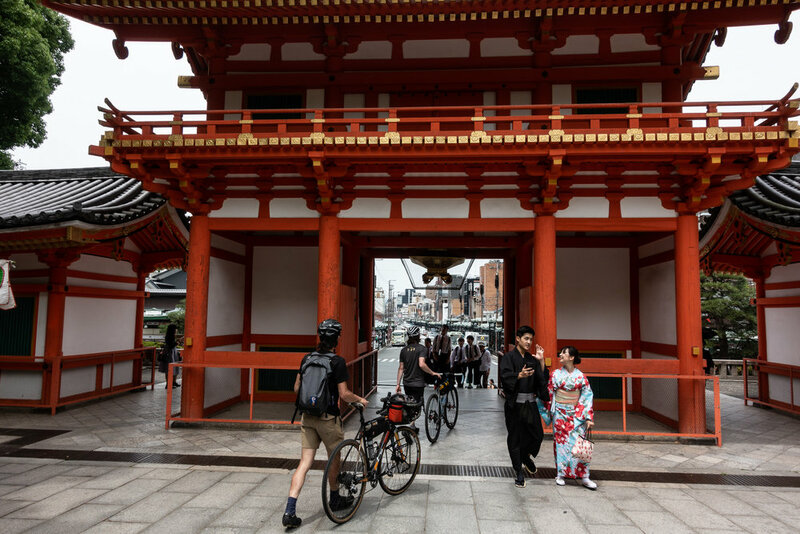 The Dōgo Onsen located in Matsuyama is one of the oldest in Japan, dating back nearly 1,000 years. We made a quick stop there after an odd faux-French style breakfast at a nearby restaurant. Joe and I paid for the basement level baths, which was inexpensive, and again found ourselves lingering between the showers and baths in our birthday suits. We departed and embarked on our final ferry trip. Once back on land in Hiroshima, we made our way immediately to the Peace Memorial Park. It was a somber experience. The A-Bomb Dome rises in the background amidst memorials commemorating that fateful summer day in August where the city suffered one of the most horrific bombing in modern history. Unfortunately the Hiroshima Peace Memorial Museum had to wait for the morning as it had just closed when we arrived. We sought out pizza. Traditional or a Japanese take, we didn’t care. After weeks of living off of 7-Elevens we wanted a taste of home. We ended up at a legitimate neapolitan pizzeria for dinner, which did not disappoint. The second dinner at Family Mart also did not disappoint. We awoke and visited the museum. Rarely have I been in a setting more overwhelmingly powerful especially being an American standing amongst a predominantly elderly Japanese crowd. If you visit Hiroshima, do not miss the museum as it is a tear jerking, but necessary reminder of the horrors of nuclear weapons. The Shinkansen from Hiroshima to Tokyo did in four hours what it took us the better part of two weeks to do. Once back in Tokyo it hit home that I was a mere 12 hours from being back on a plane bound for New York. I wasn’t ready to leave. The country had been so wonderful to us. Rarely have I been to a more welcoming country. From Humi to the woman with the Pocari Sweat to the cute couple who owned the Onomichi ramen spot, we had met so many incredible people during our journey. 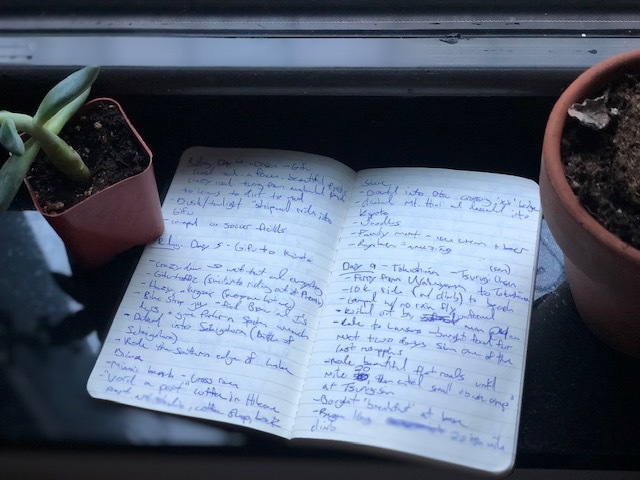 Adjusting to New York and office life after only having one job - riding for eight to ten hours a day - would be difficult. It was, but the memories helped make it easy. 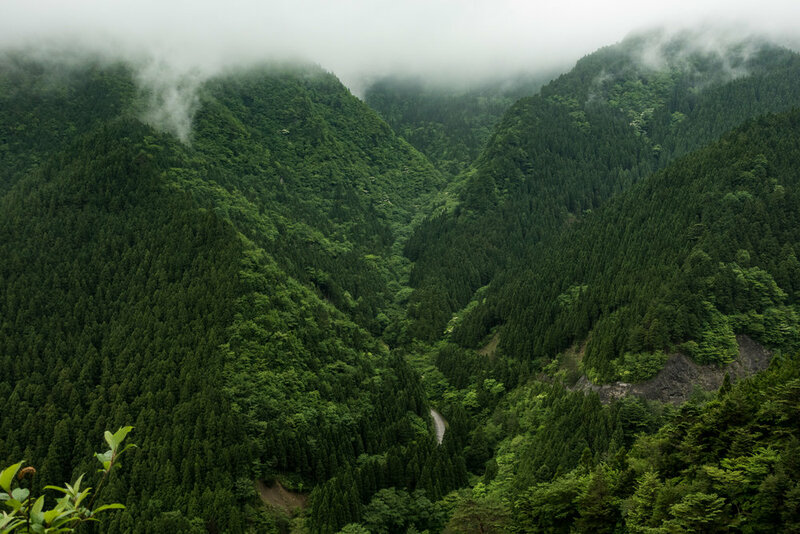 The adventurous spirit of Bashō lives in the four of us and in these words, and I cannot wait to return and see all of the places we weren’t able to visit.